The past six months witnessed monumental upheavals in Yemen. In September, the Houthi rebel movement overran Yemen’s capital, Sanaa, after efforts by Yemeni president Abed-Rabo Mansoor Hadi (who replaced the previous president, Ali Abdullah Saleh, after he stepped down under pressure from national protests) to meet Houthi demands failed. This coincided with the failure of the Peace and National Partnership Agreement. For a thorough background, meriting significantly more mention than this article can hope to provide, please check out “The Huthis: From Saada to Sanaa” and “Yemen Conflict Alert: Time for Compromise”. These articles delve, in greater depth, into the history of the Houthi movement, known as Ansar Allah, the opponents it is fighting, from Islah to al-Qaeda in the Arabian Peninsula (AQAP), and of course the Yemeni government itself. In examining the Yemen of 2015, it is important to not only consider the internal actors at play, including the Houthis, Islah, AQAP, and pro-democracy protesters who reject the Houthi takeover, but also the external actors for whom the latest events in Sanaa were a blessing, curse or consternation, depending on who you ask. The week when Sanaa fell was a tough week for Riyadh, and they undoubtedly view the new status quo as a curse. Years of efforts to maintain a friendly regime in Sanaa disintegrated after the 2011 uprisings in Yemen, and in response to the new regime change, the Saudi’s have cut off government funding and continued efforts at insulating the border from Yemen. At the same time, the death of the kingdom’s King Abdullah triggered a reshuffle in the lower and middle echelons of the royal family, and has analysts wondering what the new Saudi approach to Yemen will be. Needless to say, the kingdom will have little intention of allowing a group with ties to Tehran hold the reigns of Saudi’s immediate neighbor, Yemen. However, the Saudi’s must balance this with a strategy to combat the rise of radical Sunni militants in the gulf (e.g. AQAP) and broader MENA region, as these groups would stand the best chance of gaining popular support in Sunni-majority Saudi Arabia, and thereby pose the most serious threat to the Saudi monarchy. Yet, arguably, they are also the only remaining militarily competent group fighting the Houthis; the Saudis, with an already checkered history of shady relationships with terror groups, will now have to consider whether destabilizing the Houthis or AQAP is a more valuable goal. King Salman will undoubtedly also look on with concern at U.S. policy towards Yemen, fearing it could in some way lead to further alignment of goals between Tehran and Washington, a complaint already voiced by numerous Saudi officials. It’s a tough way to start your first year as king. On the opposite end of the spectrum from Saudi angst, it seems that the Iranian government could see events in Yemen as a blessing for its geopolitical goals. Even as the Iranian government backs Assad in Syria, Hezbollah in Iran, and anti-ISIS initiatives in Iraq, Tehran’s representative to the Iranian parliament claimed that Sanaa had joined a list of capitals that have “…ended up in the hands of Iran and belong to the Islamic Iranian revolution”. Further reports claim that the Houthis facilitated the release of Hezbollah and Revolutionary Guard members from Yemeni prison, and older reporting on Iran’s efforts to arm the Houthis make it pretty clear that Iran carries a vested interest in Houthi power. However, before analysts, and the Iranians, rush to claim an Iranian political victory, two things must be considered. Firstly, the Houthis simply are not beholden to Iranian interests in the same way as Hezbollah or similar groups. Yemeni journalist Maysaa Al-Deen warns that a combination of factors make Yemen different than, for instance Lebanon. Yemen lacked a strong government pre-Houthi takeover, and so now Houthi power can only rely on military means to remain. Yemen is squarely in the Saudi sphere of influence, which is reflected in both the existence of the Islah party and AQAP’s strength in the country, and is a heavily armed country that would be difficult to occupy fully. Secondly, the United States has not ceded its own influence in the country quite yet. The Wall Street Journal reported that the United States had, towards the end of January, pursued increased communication with the Houthi rebels “…to promote a stable political transition as the Houthis gain more power and to ensure Washington can continue its campaign of drone strikes against leaders of the group al Qaeda in the Arabian Peninsula…” according to officials who spoke to the Journal. AQAP, which claimed responsibility for the Charlie Hebdo attacks, amongst many others, has been a long term target for American drone strikes in Yemen. A recent drone strike against a top AQAP cleric in Yemen has demonstrated that the U.S. will continue to, at the very least, operate drones in Yemen, and that the change in government has not yet altered too much. Iran cannot claim a complete victory in Sanaa, or that it has secured an uncontested extension to its sphere of influence. While this may become a future reality depending on U.S. and Saudi engagements in Yemen and how they impact the Houthi strategy, for the time being it seems that Iran’s blessing is a small one at best. Despite the above mentioned overtures and the potential for cooperation with the rebels, the American government likely feels a bit of consternation at what has occurred, and not the least of which because the $1.4 billion currently invested in Yemen’s stability and counterterrorism abilities still has not produced a long-term government or eliminated the threat from AQAP. The administration’s response to the Houthi takeover, as noted by Foreign Policy’s David Francis, is that “…the State Department is so far refusing to use the word coup.” If the ‘c’ word is used, Francis elaborates, the U.S. will be forced to stop the next installment of aid to Sanaa, aid meant to bolster the fight against AQAP, the key strategic goal of the United States in Yemen, in addition to protecting its own civilians. However, now the U.S. must balance this goal with its relationship with Saudi Arabia, a state clearly unhappy with the regime change to a government potentially controlled by Iran. It also further complicates the United States’ relationship with Iran itself. Along with these actors, a few more come to mind, namely China. Just over a year ago, the Chinese government signed agreements with (ex) president Hadi of Yemen to construct ports and power plants in the country, along with a promise of expansion of future ties, all during Hadi’s visit to Beijing. Millions of dollars in humanitarian aid and support, bi-national corporations, construction and development investment, and even talks of military aid have characterized a relationship that is now over half a century old. The reason these other external actors, like China, are worth mentioning is due to their compelling interests. As Robert Kaplan emphasizes in his book Monsoon, the Indian Ocean region is a focal point for geopolitical interaction and, most notably, energy trade. Some strategists may view Yemen as another testing ground for China’s ‘String of Pearls’ strategy, to use the term coined by Booz Allen Hamilton, or as the Chinese have termed their maritime expansion, the ‘Maritime Silk Road’. Regardless of the source of Chinese interest, it may contribute to U.S. unwillingness to disengage from Yemen following the regime overthrow, lest they become shut out from Yemen on a more permanent basis. More specifically than these broad geopolitical goals, Bab el-Mandab is a key choke point through which oil and trade goods pass, with the fourth highest traffic of oil of any of the world’s major energy chokepoints. This no doubt accounts for a significant portion of global interest in Yemen, for both producers seeking to export their product through Bab el Mandeb and the powerful consumers seeking to protect (or control) those chokepoints. 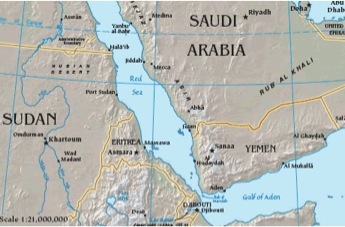 Whatever interests do account for the plurality of involvement in Yemen, it is important for those international bodies sincerely interested in pushing Yemen back towards stable governance and eliminating AQAP to consider not just the internal dynamics and grievance narratives of the Houthis, but the external actors with which they engage in some capacity. Unfortunately, while so much international interest in Yemen might seem promising, it may also signify sustained instability, should different countries choose to uphold their competing geopolitical and energy interests over those of the Yemeni interests in economic stability and political legitimacy. Previous PostNew Opportunities Beyond CubaNext PostSyriza and Podemos: Indicative of a European Shift to the Far Left?